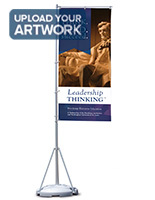 The promotional stand for banners is a TriPole advertising flag holder that stands 13' high (fabric sign is sold separately). 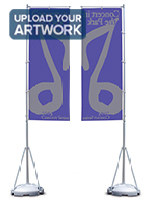 These rotating flagpoles are designed for outdoor use, and can fly 31.5"W x 94.5"H pennants in winds not to exceed 31 mph. 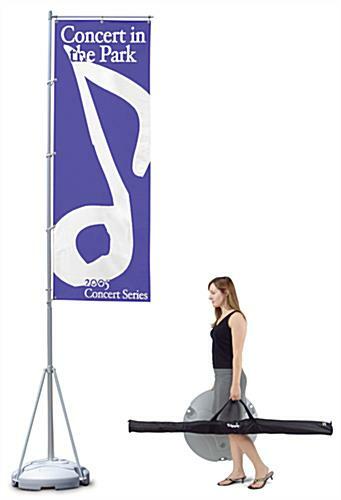 This stand for banners comes with a carry case; six of the aluminum flagpoles can be stored in back of a medium-sized SUV and still leave room for luggage. This popular display is sold in three pieces that collapse down to 59"L; a carry handle has been molded into the underside of the lightweight base. It only takes one person to set up this aluminum sign fixture, so busy sales people love it! A flag support arm extends along the top of the pennant, and the bottom grommet has a hanging weight, so messaging is always displayed even in minimal winds. Wind easily passes through the three bottom legs, discouraging tip-over. The molded polymer base underneath can be filled with sand or water for additional stability. This display is sold separately from the banner; purchase flags and pennants from this website. This 20 lbs. 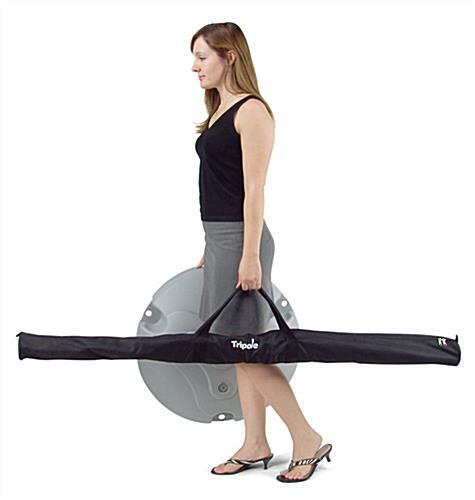 sign system includes a padded carry bag for transport between office, trade show, and exhibit. A removable pouch with a zipper can be found inside the bag for hardware so that the pieces don't get lost. 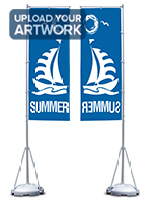 This flag display for advertising is superior to traditional flagpoles and windsocks. 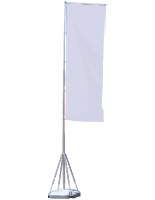 The support arm keeps the banner open and visible, even in no-wind situations, so they are never droopy. 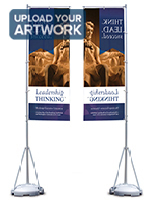 The advertising flags are designed to rotate freely with the wind around the pole, creating an eye-catching visual that attracts the attention of passersby. Due to the flexibility of this fixture, the TriPole holds up to higher winds than competitor stands. Please Note: Printed flags are NOT INCLUDED. When leaving units outside for extended periods of time water level in the base should be monitored frequently. 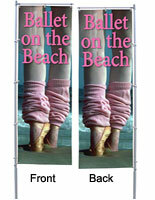 We offer custom banners for these TriPole advertising pennants. We have researched many promotional display options and feel this solution is the best one at the most reasonable price. These are real flags that move in the wind, not stiff, heavy vinyl systems. While one might find less expensive pennants, with proper care, these will last for years without fraing, and with little or no fading.